A healthy diet prevents malnutrition and protects from diseases like obesity, heart disease, diabetes, cancer and stroke. Today, many people’s diets consist of more saturated fat, trans fats, sugars, and more sodium than fruits, vegetables and dietary fiber. Your body’s health reflects what you put into it. Eating a poor diet reduces physical and mental health because eating healthy allows people to be more active. Two-thirds of people who eat fresh fruit and vegetables daily report no mental health issues, as reported by the Mental Health Foundation. Compare this to those who do have some level of mental health problems and have generally reported eating less healthy foods and more unhealthy foods. Feelings of well-being can be protected by ensuring that our diet is full of essential fats, complex carbohydrates, vitamins and minerals. Nearly two-thirds of American adults are overweight or obese. According to the U.S. Department of Agriculture, a healthier diet could prevent at least $71 billion per year in medical costs and lost lives. That number may be underestimated because it only accounts for diet-related coronary heart disease, stroke, cancer and diabetes. It does not include other diet-related illnesses. Seventy-five percent of health care dollars are spent on treating preventable diseases. Eating a nutritious diet filled with fruits, vegetables, whole grains, dairy and protein will help maintain a healthy body weight. Janelle Hodovic, a Registered Dietician with UnityPoint Clinic - Weight Loss, says this about nutrition: “There is no one diet, no diet pill and no surgery that lets people eat whatever they want and still expect weight loss and improved health. Maintaining a healthy diet and exercise program will be what is needed to achieve those goals. 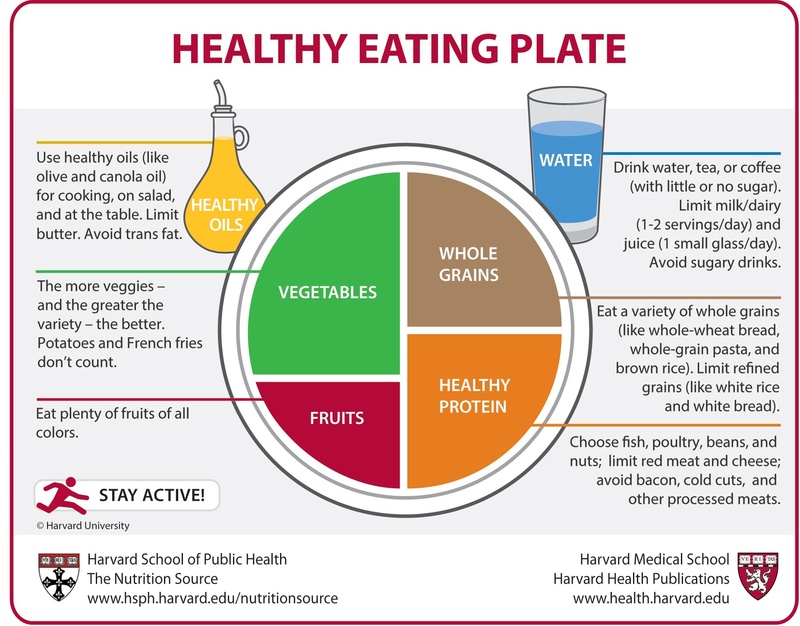 Use food for its purpose: Nourishment.” Healthy Eating Plate discusses how to make the best eating choices. If eating healthy makes you think about the food you can’t have, refocus your thoughts on the foods you can have. Put a new spin on an old recipe to make it a little healthier. You don’t have to give up your favorite comfort foods; it’s all about balance. Adding a variety of fruits and vegetables to meals can help you control your weight, blood pressure and cholesterol. Our immune system is our defense against disease, but poor nutrition is the most common cause of immunodeficiencies worldwide. Maintaining your immune system requires an intake of proper vitamins and minerals. Eating a well-balanced diet, including fruits, vegetables and food low in fats, will help support a healthy immune system. Foods like tomatoes, berries, avocados, nuts and fish all contain certain vitamins and minerals that are good for the skin. For example, tomatoes contain vitamin C, which helps build collagen, in turn making your skin look firmer and slow premature aging. Berries are full of antioxidants and vitamins and eating them promotes cell regeneration for new skin. Our bodies derive energy from the foods and liquids we consume. The main nutrients our body uses for energy are carbohydrates, fats and protein. Carbohydrates such as whole-grain breads and starchy vegetables are the best for prolonged energy since they are digested at a slower rate. Water is necessary for transport of nutrients, and dehydration can cause a lack of energy. A deficiency in iron may cause fatigue, irritability and low energy. Food rich in iron includes seafood, poultry, peas and dark green leafy vegetables such as spinach. To better absorb iron from these foods, it is best to consume vitamin C at the same time. Think of including vitamin C rich foods like broccoli, kiwi, peppers, leafy greens and tomatoes in meals full of iron. According to the Centers for Disease Control and Prevention, risk factors for chronic diseases, like type 2 diabetes, have been increasingly seen at younger ages as a result of unhealthy eating and weight gain. Among adults ages 20 to 74, diabetes remains the leading cause of kidney failure, blindness and non-traumatic lower-extremity amputation. Dietary habits are typically established in childhood and carry on into adulthood, making it crucial to teach children the importance of eating a healthy diet early on. Diets low in carbohydrates increase feelings of tension whereas diets high in carbohydrates have a more uplifting effect on mood. A diet rich in protein, moderate in carbohydrates and low in fat will have a positive effect on mood because it leaves an adequate supply of iron, omega-3 fatty acids and iron. As much as food affects our mood, mood affects our food choices. When we experience feelings of sadness, we are more likely to choose unhealthy foods. People feeling happier feelings are more likely to choose healthier foods. Food has an impact on the way we think. When the body is low on glucose, the brain is not receiving the energy it needs to remain focused. Diets high in fat and cholesterol can seriously damage the brain by building up plaque in brain vessels, damaging brain tissue and causing strokes. Eating fruits and vegetables throughout the day helps keep the mind healthy and engaged. Your body needs food in order to survive, but the process of breaking down food nutrients, or metabolizing, causes stress on the body. Overeating creates more stress on the body and could lead to a shorter lifespan. According to research done by Columbia University, 18 percent of deaths among white and black Americans can be attributed to obesity. Obesity could potentially lead to a decline in life expectancy in the United States. Diets that are rich in nutrients and do not contain processed foods have been found to have a positive effect on life expectancy. If you aren’t sure if you are following proper eating habits, consult your primary care provider to discuss your concerns or questions. You can always reach your UnityPoint Clinic provider by sending a direct message to your care team using My UnityPoint.